Opening Reception: Friday, January 22 from 6:00 p.m. until 8:00 p.m.
Catinca Tabacaru Gallery presents , an exhibition of new works by Japanese artist Shinji Murakami. Featuring 14 works in flat, sculptural and LED form, the gallery will be filled with flowers, hearts, rainbows, sparkles and a galloping horse to boot. While “cute,” might be the first impression, what follows is the hand of a master craftsman working in wood with the precision and detail orientation famed in Japanese tradition. In line with his three-decade long affair with 8-bit technology, Murakami has selected emoji as the avatars of his new series of works. This increasingly rich digital vocabulary recently exploded into mainstream culture as a deeper and more personable way to express thoughts and feelings; a new borderless language, transcending nationhood and generational gaps, was born. By the time the Oxford Dictionary made its annual word in 2015, the news was hardly a surprise. Murakami’s art world journey began on the streets of Tokyo more than 15 years ago. Instead of tagging his name and limiting his audience to hip graffiti kids, Murakami drew characters that would engage a broader range of children and adults – puppies, flowers, bunnies and hearts. These new age hieroglyphics became the beginnings of Murakami’s own borderless language, exploring simplification as its core concept and aiming to offer happiness on a global level. Emoji are made of pixels and pixels are building blocks that can be arranged in a finite number of ways then colored from a limited palette. 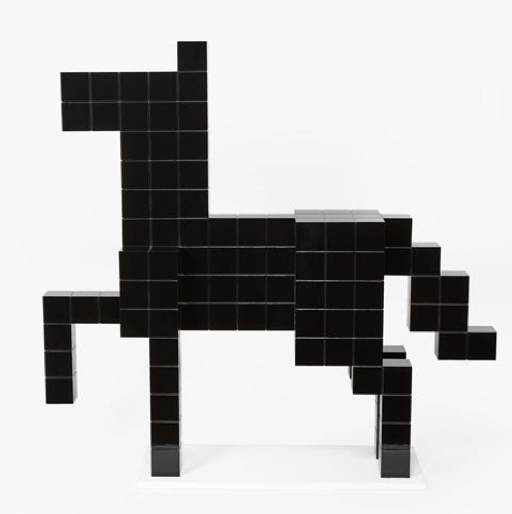 Murakami’s sculptures, some reaching 5-feet in height, present no extraneous details as “pixels” are rendered of hand-cut wooden blocks, painted in acrylic and enamel, and stacked to create bold minimal forms. In the same vein, three paintings and an LED drawing use no more than a few colored squares to express the complex environment that incarnates a virtual world into our physical realm. For more information, please visit Catinca Tabacaru Gallery’s website.